This past Friday was the 50th day of school at my daughter's school, and what better way to celebrate then having 50s Day! My daughter was super excited when I explained she would get to wear a poodle skirt. She was also super confused when I tried to explain what 50s Day was, but hey she had fun anyway. 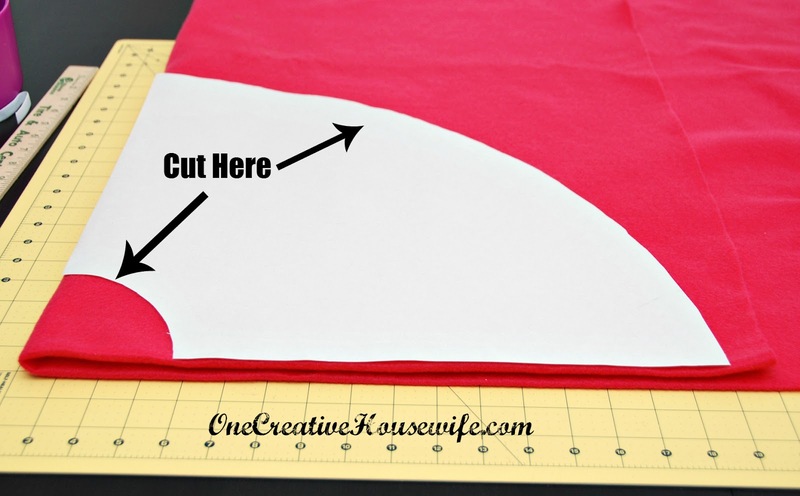 I used the tutorial from Dana at Made to figure out how to measure for the circle skirt. 2. Add 2" inches to the waist measurement, and divide by 6.28. For this skirt I used 19" + 2" = 21"
3. 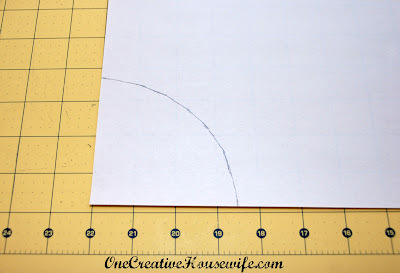 In a corner of a large piece of paper (or a bunch of pieces taped together), measure 3.3"(Your Magic Number) and draw a 1/4 circle. 4. Measure from your waist to your knees (or where you want your skirt to end). For my daughter I measured to right below her knees 11". 6. Starting at the 1/4" you already drew, measure 13" (Your Length) and draw another 1/4 circle. 7. 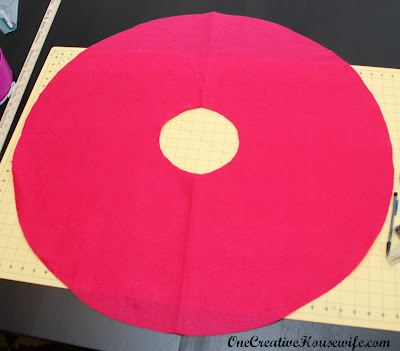 Cut out your 1/4 circle. Only cut on the 2 lines you drew! 9. Lay and pin your pattern to your fabric. 10. Cut out your 1/4 circle. 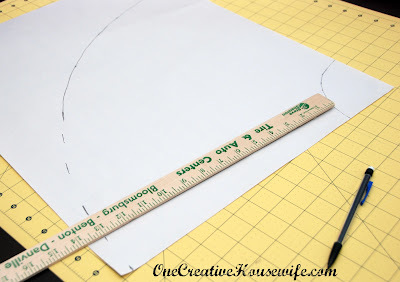 Only cutting on the 2 lines you drew for the pattern. 11. 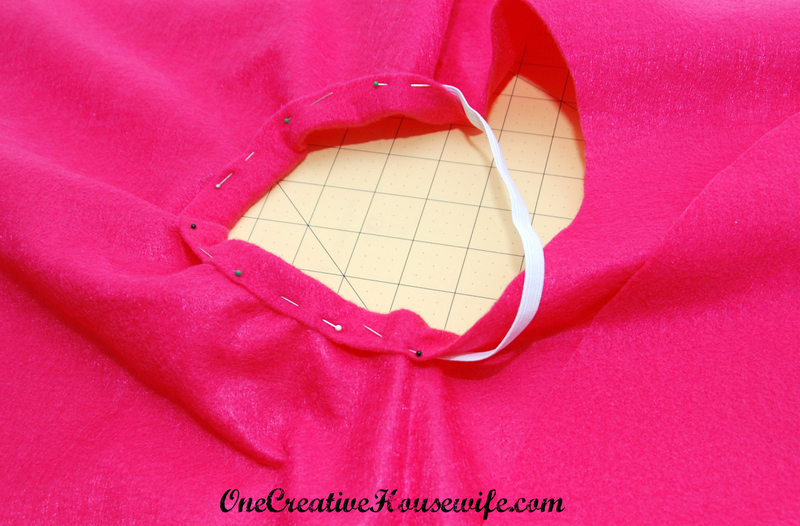 Remove the pins, and pattern, and unfold your fabric. Now you have a donut! 13. 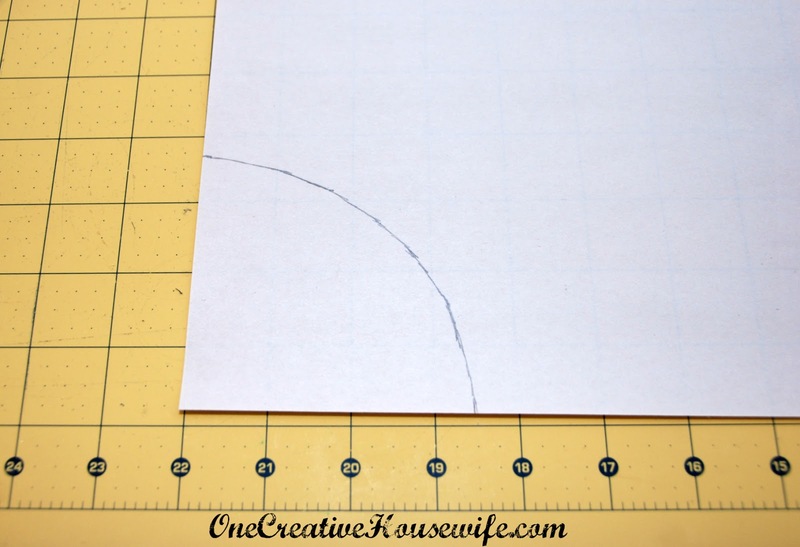 Cut a piece of 1/2" elastic 20" (Your Elastic Number). 14. Overlap your elastic by a 1/2" and sew the ends together. 15. Create a "pocket" for the elastic, at the waist end of the skirt, by folding the felt over the elastic and pinning it. Do not pin trough the elastic. 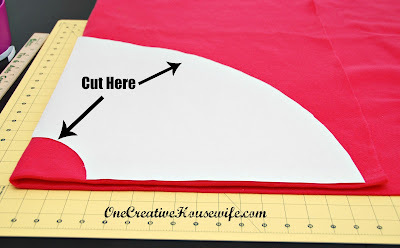 You could fold the felt under so you don't have a raw edge but since felt doesn't fray it doesn't matter. Plus, it will be on inside of the skirt so you'll never see it. 16. 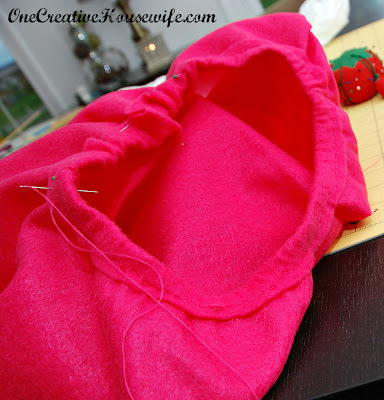 Sew the "pocket" closed, either by hand or using a machine. I did it by hand because I didn't have enough bright pink thread to use my machine (poor planning on my part). 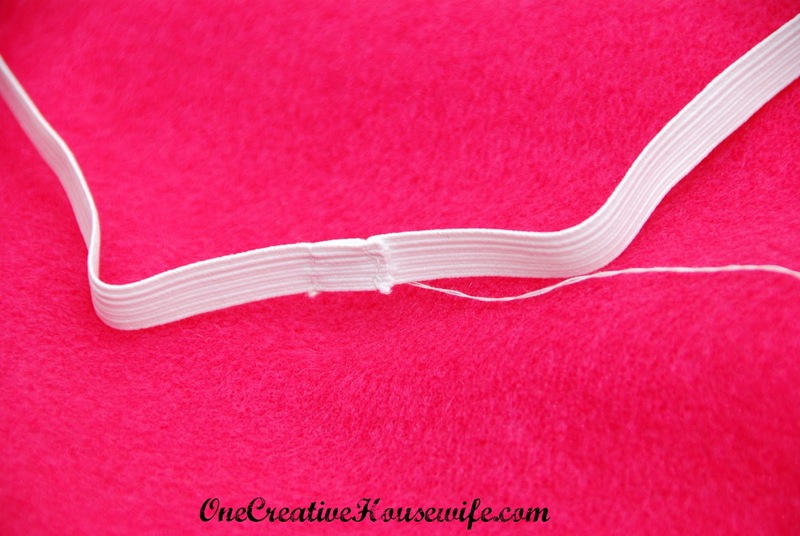 Do not sew through the elastic. 17. 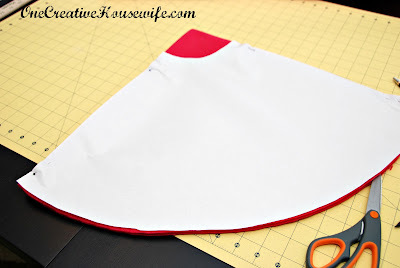 Then turn your skirt right side out. 18. 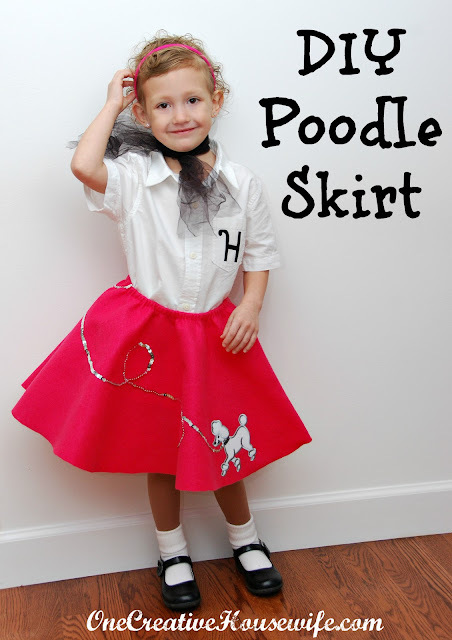 Decide where you want your poodle applique, and sew or iron it on according to package directions. 19. 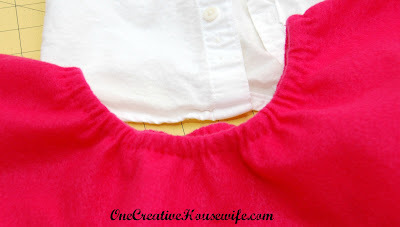 Sew on the ribbon or sequin rope, in whatever design you want. 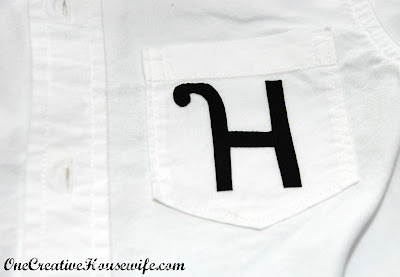 To make the shirt I just freehand cut a letter H out of and iron-on patch, and ironed it on a white collared shirt. For the scarf I just tied some black tulle around her neck and cut it to the length I wanted it. Andrea, this is darling! I love the simplicity of the skirt and the letter on the pocket. (I'm a total Lavern and Shirley fan!) I'm pinning this, and I hope I can talk my girls into costumes like this for Halloween next year! Thanks for the great tutorial. Thanks! 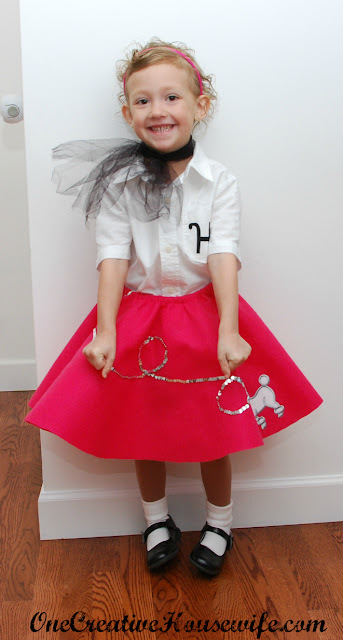 I was actually really excited her school decided to do 50s day because I tried to get her to do this for Halloween and she wouldn't.